If you read the blurb you’ll know what is going on in the novel. It’s pretty short but the pacing is good. In this story we meet two characters that are going to give us a sneak peek into how everyday life in the Wyr World is. Alice Clark is a school teacher and a wyr, I won’t spoil the surprise of what kind of shifter she is, but it’s pretty cool. She has an apartment and she is basically an average woman. On the other hand we have Gideon Riehl, a wolf wyr that used to be part of Drago’s Army but is now part of the WDVC – the Wyr Division of Violent Crimes-. Gideon is in a place in his life where he is ready to settle down, hence his more sedentary work. Alice and Gideon find each other in particular circumstances: Alice just discovered the mutilated body of one of her friends, the third one in three days, and Gideon is investigating the murders. Once they see each other they realize that there is a sexual attraction between them and they are actually mates. I’m sure that some of you will think that the romance was a little rushed, but if we take into consideration the setting that Thea Harrison has crafted for the Series, their romance makes perfect sense. I found the plot very appealing, perhaps because Romantic Suspense is my favorite genre and the story is definitely that. More than that, we got an interesting glance at the everyday, average wyr, no sentinels, queens or kings, but a mortal wyr with needs and hopes that we can easily relate to. The suspense part was fine, there was Alice’s anxiety because she is the next in line to be murdered but she has a big, strong wolf with her all the time so you know that nothing bad will happen to her. On the down side, the killer is not so puzzling, is not so hard to figure out who it is. The things that makes this novella a marvelous addition to the series are the stories within the story. There are a couple of legends about the wyrs that are amazing; moreover, there are lots of details about wyr society, their belief system and holydays, which definitely help us to gain a better understanding of Thea Harrison’s World and we get to see how complex and interesting it is. 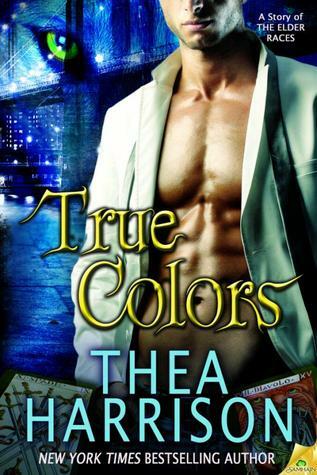 True Colors is a wonderful story and perfect appendix to the series. I recommend you to read the firsts books before reading this novella because of the complexity of the world. But this is definitely a must read that will help you bear the wait for Oracle’s Moon. Way to go Ms. Harrison, you absolutely brought back the charm! I read this one over the winter break and I really enjoyed it. Love how she shows us a different side, the common side, of the wyr world and I loved the mythology and the explanation with the gods and the tarot cards. Thanks Brie,I really liked True Colors and I actually enjoyed it more than Dragon Bound because I wasn't trying to understand the complications of politics and the like. I really loved this one too! I wasn't a big fan of Serpent's Kiss, but I LOVED Oracle's Moon. It's the best in the series yet, IMO. Yes this is definitely a way back for the series! I've only read Dragon Bound but I do have the next in the series. I hear alot that the series sort of wanes a bit so I'm glad to see another story add some excitement again. I'll have to catch up on this series real soon so I can pick up this novella. Great review Marie! I think you'll enjoy it, and the good thing is that Oracle's Moon is just around the corner so the waiting won't be long! Hmmm, I'm still debating whether I should continue this series... I'd like to see the "normal" life of the wyrs though. I'll have to keep this one in mind. Thank you for the review, Marie! OMG, I'm so excited. How did I not know this novella was coming out? I'm so tired, but I want to buy it and read it right now. I guess I'll have something to look forward to tomorrow. I understand a little of how you feel as far as the series not being quite as exciting as Dragon Bound but seriously, that book was so awesome, I knew it would be hard to keep up to that level. I REALLY enjoyed books two and three but they weren't as exciting. However, her not as great books are way better then many VERY famous author's in the genre's best books. Have you read Oracle Moon yet? It's the closest to Dragon Bound for me. I've read it 3 times already, kinda like I did with Dragon Bound. I have not!!!! Did you get an ARC?!?! Everyone says Oracle's Moon is just as good as Dragon Bound. I really liked True Colors but I've yet to read Serpent's Kiss, I need to catch up before reading the next book. I agree with you, her less-than-great books are way better than most of other fantasy books out there, I won't deny that she's a talented author.